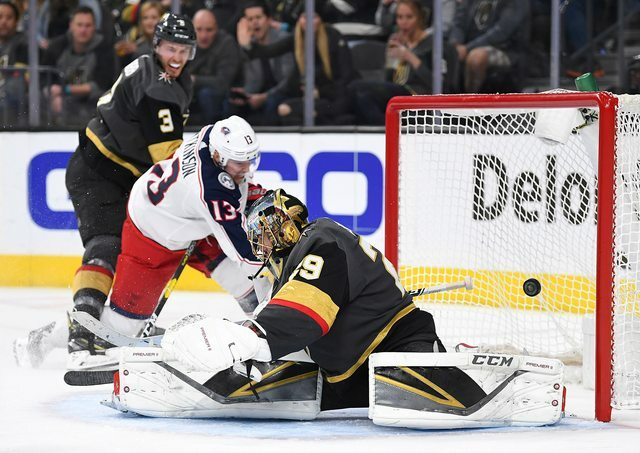 William Carrier made his long-anticipated return to lineup as the Golden Knights dropped their third straight home game by a score of 4-3, against the Columbus Blue Jackets. Cam Atkinson led the way for the Columbus comeback, scoring the game-tying and go-ahead goals for the Blue Jackets, late in the third period. Marc-Andre Fleury turned away 29 of 33 shots in the contest, as the Golden Knights were outshot 33-23 on the night. As the third best play-driving team in the NHL (Corsi For %), it is uncommon to sed the Golden Knights outshot, let alone by a double-digit margin. Columbus played a very impressive neutral zone game, on both sides of the puck, giving the Golden Knights some trouble. As a team, the Blue Jackets displayed good team speed in transition, mixed with active defensive sticks, bottling up the Vegas attack. Josh Anderson opened up the scoring for Columbus just 4:04 into the game, redirecting a Seth Jones point shot through Fleury. Jones made a perfect shot and Anderson simply had to be there, a pawn in Jones' master plan. Nate Schmidt wasn't a fan of trailing the BJs and evened the score back up on the next shift, 32 seconds after the Anderson goal. Schmidt jumped into the rush and attempted a centering pass that deflected off defenseman Ryan Murray and into the net, over Sergei Bobrovsky. Jon Merrill gave Vegas a 2-1 lead late in the first period when he made a perfect read, jumping into the offensive zone and burying the William Karlsson rebound for a shorthanded goal. 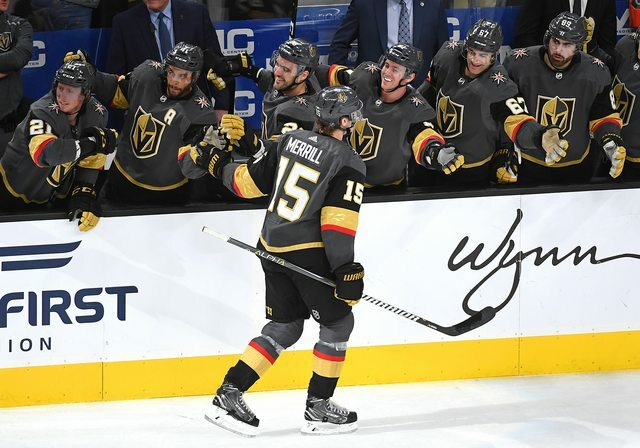 The goal was just his second of the season, but displayed the instincts that Merrill possesses and the value Vegas General Manager George McPhee anticipated at the expansion draft. Artemi Panarin would score the only goal of the second period, tying the game at 2-2. He found himself in front of a wide-open Vegas net for one of the easiest goals he will ever score. A Columbus dump-in took a bad bounce off of the boards behind the Vegas net and back out front, past Fleury who came out to knock the puck down. Panarin is way too skilled to miss that opportunity as Fleury made every effort possible to get back in the net and stop the Panarin drive. Columbus controlled the play throughout the second period, with Panarin and Cam Atkinson displaying their raw speed and talent throughout that 20 minute stretch. Vegas was limited to a disappointing three shots on goal in the second period, a testament to the Blue Jackets' defensive recovery speed and active sticks. Although Columbus had the better of the action in the second and third periods, Vegas got a go-ahead goal from Cody Eakin to give Vegas a 3-2 lead with 10:39 left in regulation. Eakin hammered home a Pierre-Edouard Bellemare pass for his 15th goal of the season. The warm and fuzzy feeling was short-lived as Cam Atkinson decided to take over. Atkinson used his speed to pick up a Artemi Panarin bank pass in the neutral zone and got beautiful body position on Brayden McNabb on his way to Fleury's net. His first attempt was stopped, but he was able to chip his own rebound past Fleury, to tie the game. He would go on to score the game-winner on the power play with a sharp wrister that beat Fleury high, off the crossbar and in. Blue Jacket captain Nick Foligno provided a perfect screen and their All-Star representative this season ripped an amazing shot for his second of the game and 31st of the season. His career high was 35 goals in 2016-17 and he will certainly pass that before the season ends. This is his sixth straight season with at least 20 goals, he knows how the light the lamp. In an interesting development for the Golden Knights, the third line was stapled to the bench in the third period, sans Cody Eakin, essentially leaving Vegas with 10 forwards down the stretch, as the BJs took over and won the game. 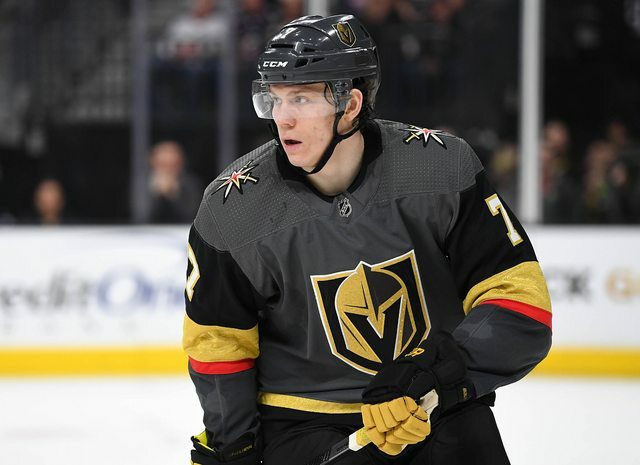 Both Tomas Nosek and Valentin Zykov were relegated to watching the end of the game, in a move that may have left Vegas too undermanned to hold off Columbus. Following the game, Nate Schmidt said, "It feels like we scored (to make it 3-2) and then stopped playing", but the problem may have been two players, actually weren't playing. With 92 and 7 out of the rotation, Eakin and Bellemare became the third line flanked by either William Carrier or Ryan Reaves, trading off shifts. It would be safe to expect to see both healthy scratches, Oscar Lindberg and Brandon Pirri, in the lineup on Tuesday, seeing how head coach Gerard Gallant "used" Zykov and Nosek down the stretch. With the loss, Vegas falls to 31-22-4, following two straight road wins in Detroit and Tampa. They are now 2-5-0 in their last seven games. Despite the loss, Vegas remains nine points ahead of the Vancouver Canucks for third place in the Pacific Division. San Jose moved within one point of first with their win over the Oilers and the Flames' loss to the Canucks. Vegas' next game will be on Tuesday, hosting the Arizona Coyotes, before another tough game Thursday against the Toronto Maple Leafs. Things may get a little rocky in Vegas while they try to find the right mix of players, heading toward the trade deadline. Now, more than ever, they could use an infusion of depth/power play help and ideally they'd get that from either Wayne Simmonds (Philadelphia) or Mark Stone (Ottawa) who are known to be on the trade block. George McPhee will have to do some serious roster evaluation in the next couple weeks, but something must change for the Vegas Golden Knights before the surging Canucks and Coyotes make it back into the playoff hunt. Be sure to follow me on Twitter (@VGK_Buzz) for your Golden Knights news, analysis, and updates.